Hey Import Wizard, Good Job! Anyone who has spent some time around Business Objects before BI 4 should be familiar with Import Wizard. It has a little clunky and hard to control, but once you learned to follow and few rules and respect its limits Import Wizard became a powerful tool in your hands. I heavily used Import Wizard to migrate/promote content between development, integration/testing, and production environments. I also used Import Wizard to pull content out of lower versions of Business Objects and into my beloved BO instances. I used Import Wizard as a tool to synchronize BO object CUIDs across environments and I even used Import Wizard to make an exact copy of an entire environment into the itself (giving each copied object a new CUID). I truly grew comfortable with this great tool and I even loved its ability to create archives into BIAR files. 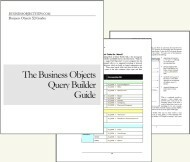 With the release of BI 4, Business Objects has shifted a lot of fundamental pieces around. One of these shifts is the retirement of Import Wizard. However, I believe that many parts of Import Wizard continue to live on in the Upgrade Management Tool (UMT). The UMT, unlike Import Wizard, is restricted to the migration of Business Objects content from a lower version of BO into the CMS of a higher version of BO. UMT cannot be used to migrate content between to BO environments of the same version (although, I believe I heard that someone once tricked it into allowing this). Clearly the intention of UMT is to help you upgrade your BO objects, but many parts of UMT do feel like Import Wizard with a facelift. In the early versions of BI 4.0 the functionality of migrating BO content between two BO environments of the same version is handled by a new-ish tool called Life Cycle Manager (LCM). To be honest, LCM exists in XI 3.1, but I always found it to be more trouble than working with Import Wizard so I mostly ignored it. LCM was optional in BO XI 3.1. However, in BI 4.0, LCM became the only tool available to promote content from one environment to another environment of the same patch level. The details escape me, but at some point in BO BI 4.1, LCM was renamed “Promotion Management” providing yet one more contender for the “PM” acronym. I find this name more fitting, because I already used the verb “promote” to describe the main function of “Promotion Management”. Early on LCM and Promotion Management had a limit of about 100 objects. In other words, Promotion Management could only handle jobs with 200 or less documents, folders, security objects, etc. in total. However, I am now told that the limit has been increased with the release of BI 4.1 to 2000 objects. This is wonderful news. One of the best features about LCM and Promotion Management is that non-administrative users can be granted the right to define promotion jobs. These same users may also be granted the right to run/execute those Promotion Management jobs. Contrast this with Import Wizard and you will see that Promotion Management enables many opportunities to allow “developers” to easily promote their work across the different environments and the Business Objects administrator can decide what level of access is needed. can using the import wizard on different sp’s cause an issue? We used the import wizard using bo3.1 sp3(source) to bo 3.1 sp7(destination). I am noticing some issues with the universes. Hi Chris, this could cause you issues, but I am not certain of that. It is always best to use Import Wizard of the highest patch level. Could you just do the migration Import Wizard job again using the 3.1 SP7 Import Wizard? I highly recommend this. You mention the UMT can only go from a lower version to a higher one. This si from Version 3.x to version 4.x only. It would not let us go from 4.0 SP6 to 4.1 SP1. There is a command line switch you can use to ignore Versions but it’s not supported. SAP told us they have planned improvements to Promotion Manager, but it is really a bad tool. They really need to redesign the tool from the ground up and include large customers for input. You mention the UMT can only go from a lower version to a higher one. This is from Version 3.x to version 4.x only. It would not let us go from 4.0 SP6 to 4.1 SP1. There is a command line switch you can use to ignore Versions but it’s not supported. Hi Jon, you make a good point. UMT is only meant for 3.x to 4.x. I knew this, but did not communicate it very well with my vague statement. I’ve been using Promotion Management in BI 4.1 and I find it much improved of its state in 3.1. It isn’t perfect, but good enough most of the time for moving small batches of content between environments. In Boxi3 we “learned” that users who develop reports in PROD, but in a special folder “experts_developers only”, are mostly the same users testing new universe releases in test. Of course they regularly want their “production reports” to be moved to test, be it to see if they are still valid with the new version of the universe, or to “tweak” them with the new universe and have them “ready” when the universe gets the go for prod. We foresee that the same will happen in BI4 : develop reports in both prod and test/acceptance , then want to sync these environments on a FOLDER level. And vice versa for moving a doc from prod to test: on prod, put it in folder prodToTest, wait for promo object to run, retrieve object from ProdToTest in the test environment. Create folder A in dev, create promo object to test, run it : bingo, the folder appears in test. But I changed the COMMENT on the folder, re-ran the promo object but the comment in test is not changed. Same thing when i change the folders NAME :NOTHING happens in test when I run the promo object. I add a webi document to the same folder, re-run the promo object and again: the CONTENT of the folder is NOT updated/promoted. What did I miss here ? Do I always need the exact DOCUMENTS to be included in the promotion object ? Is there another way to do this, or better: to AUTOMATE such back-and-forth ? It sure would help our developers. Our migration is completely on hold as of now due to this issue. Need help on this at the earliest. I’m trying to migrate some Crystal Reports from our 3.1 system to 4.1 using Promotion Management. However, when I do I’m recieving this message: SDK Version 1400 does not support Crystal Enterprise version 1264 (FWM 02032). From my readings I understood this was possible. Any idea what’s up? Hi Trudy, I believe that you can only upgrade documents using the Upgrade Management Tool (UMT). Promotion Management is just for moving documents between different environments of the same version. We have been testing again. For promoting (alligning) SECURITY between BI4 environments, Promotion Manager is … worthless. It can promote GROUPS, but when the group has multiple parents, these parents have to be in the target already, AND ample checking was needed, because some memberships were promoted, others weren’t. As if Promotion Management only recognises ONE PARENT per object promoted. That works for the “trees” of folders, of course: every universe has ONE parent folder, every webi doc has one parent folder. It does NOT work for the FAMILIES though (groups ordered in acyclic directed graphs, AKA families, with most “children” having more than one “parent”. There is a HIERARCHY in these groups, plus a group that “accesses the universe objects to refresh data” (View On Demand) needs SOME access in BI LaunchPad and in Web Intelligence applications ( groups APP_WEBI , APP_LaunchPad) and thus the group is member of both APP-groups. Because PROMOTION MANAGER will not (reliably) port this structure to Acceptance or Prod, we DO use the UMT for these promotions (yes, “-internal_use_only_noversioncheck” is “not supported” but it is the ONLY TOOL to do the job, unless Promotion Manager be used to “promote” each and every folder separately, then the groups, and the membership structure is manually applied in ACC and PROD … a real waste of time. We are curious whether SAP will either “support the extra switch” in the near future, OR re-brand a copy of the UMT that has the switch hard-coded. But there was still no sign from SAP to do that. Yes, there are THIRD PARTY TOOLS who can do that. Thank you for your response. I have one additional question. As you can probably tell from my first question we’re upgrading from 3.1, SP6 to 4.1, SP6, Patch 7. In all my readings it was noted upgrading from our 3.1 level to 4.1 was supported. I also read that 4.1 supported the running of legacy versions of Crystal Reports (our shop is entirely Crystal Reports). However, it appears we have to upgrade all of our reports to Crystal Reports 2013. Is that correct? If so, I found no where that SAP was clear about this. as the UMT will indeed copy your documents from BO3 to BI4, this is something you can test. The UMT leaves your original (in BO 3) untouched. When you move one document to your new BI4 “dev” environment, try to run the SAP Report Conversion Tool on it. If it doesn’t work for one report, then open a ticket with SAP support. When documentation is not clear, support may help you find out. Thank you, Hans. I’m looking into the impact this will have on us. Does anyone know of a way to restrict rights in UMT so that developers can move reports from on version of BO to another (XIR2 to 4.0) without being able to also copy the XIR2 Universe over into 4.0? Hello, off topic (sorry couldn’t find a more appropriate thread) but do you know a way to limit access to a BI 4.0 cmc web app to local access only? We don’t want it exposed to the outside via the full url (https://servername:8443/boe/cmc), but need it local only (https://localhost:8443/boe/cmc). 3)	Choose Use the object’s name and path to determine whether it already exists in the destination system and then choose “Update the destination object” and click NEXT. 4)	Click on ‘Select groups that contain selected users’ and then check to see what users have created the recurring jobs in the SOURCE environment and then choose it for the import wizard. It is important that you select this option first before choosing the individual user so that the groups will follow that user automatically. In my example, the SOURCE environment is showing jsmith as the job scheduler for SD001 report, so I will select ‘jsmith’ as the user (see below) and click on NEXT. Any insight as to why this is so??? Makes no sense to me.